Saved Views give you ultimate control in optimizing how you view the information in your pipeline. They allow you to customize your pipeline based on certain criteria to surface the relevant boxes for a given task. Do you want to view only the boxes assigned to you? How about all boxes that have not had any interaction within the past week? With Saved Views, isolating this information is quick and easy! Start by clicking the Saved View Editor button at the top right hand side of your Pipeline. 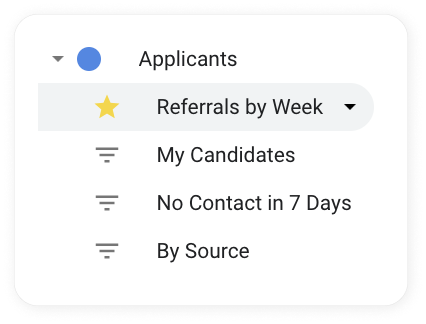 The first section allows you to Filter Boxes that match a specific criteria. This is where you will select the attributes that are relevant to you. Click "add" to add a new filter rule. The first dropdown lets you select which field you want to filter on (name, stage, any of your custom columns). The second dropdown specifies the operation. The last input is the value you want to filter on. For example, isolating all boxes assigned to you would look like Assigned to > Is Any Of > Me. You can add multiple filter rules that will all apply at the same time to the list. For example, you can Filter to "only show Boxes that have been created in the last 7 days AND are assigned to me". Click the + button and choose whether your results must satisfy both criteria, one of the criteria, or none. The second section allows you to choose how you would like your boxes Sorted and Grouped within your Saved View. By default, the pipeline is Grouped according to the Stage column. You may choose to group the pipeline by any column. For example, if you grouped all boxes based on the person assigned to each box then each grouping would be a person on the team. Sorting allows you to define what order Boxes should be sorted by within each grouping. For example, you can sort all boxes alphabetically A-Z according to the Name column. You can also Sort by multiple columns simultaneously. 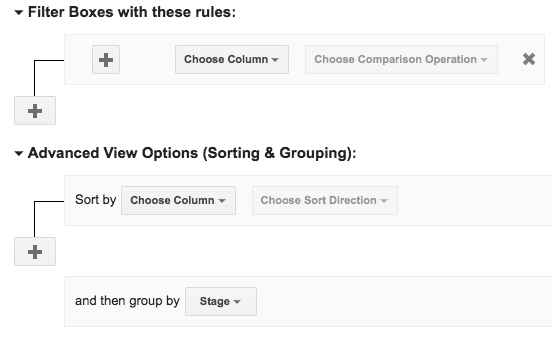 Once you have your Filtering, Grouping, Sorting rules setup, press Apply to view the results. You will then see the results of your view which you can then Save from the yellow banner. Select a name that appropriately indicates what you’re looking at in that particular window. In your new Saved View, you can also freeze, hide, reorder, and re-size columns in your pipeline. These configurations will save with the Saved View for future viewing. Please note that adding a Column and deleting a Column from your Saved View will also add or delete the column from your main Pipeline view. You can find existing Saved Views nested underneath the name of each Pipeline in the left navigation bar. Anyone else shared on the Pipeline will be able to see the views as well. Rename, Duplicate, and Delete options operate as named. When you have more than 6 Saved Views, we will help collapse them into a more manageable list. We will display four Saved Views by default, but the system will display all Starred views, regardless of number, so you can use the 'Star' function to show more than four views at one time. To see all of your Saved Views, click See All... which will open up the Saved View Manager. From the same screen, you can also click and drag the list of Saved Views to reorder them in your left navigation bar. Saved Views are shared with everyone shared on a Pipeline. However, Starred views and the order of the views are specific to each user.